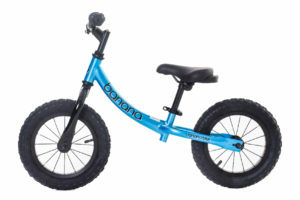 A BMX balance bike makes a great choice when learning to ride, as it will allow you to get off road (or off-pavement) and experience all of the fun of a BMX while riding in the park! 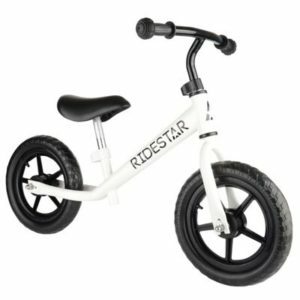 A good BMX style balance bike will resemble the real thing, with a sporty design and a lightweight frame that is easy to handle and manoeuvre. 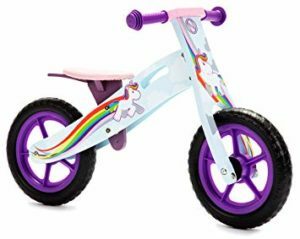 As with all balance bikes, a good quality bike will have an adjustable saddle, a comfortable seat and handlebars offering plenty of grip. 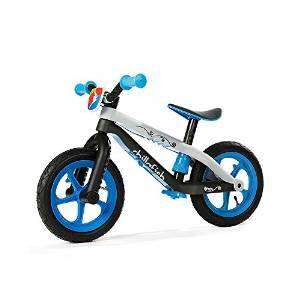 Our favourite BMX style balance bike is the Chillafish BMXie bike. This bike has a cool and stylish design that is just like a real BMX, as well as a fibre glass-reinforced frame and Airless RubberSkin tyres. 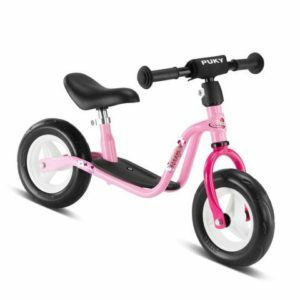 The saddle height can be adjusted from 32cm – 39cm, so this makes it an ideal bike for 3-4 year olds or those approaching their third birthday. The seat is easy to adjust with a simple twist and lock system. 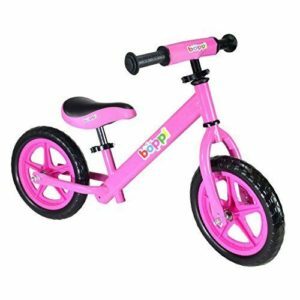 Budding BMX riders will love this bike which is available in a range of vibrant colours, and also includes fun extra features such as a detachable front number plate and detachable footrest for gliding. 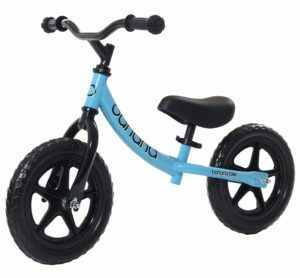 The Chillafish BMXie Balance bike is available from £64.95. The Boppi BMX balance bike is an excellent alternative which is slightly cheaper, and makes a great choice for 2-3 year olds with a lightweight frame in combination with an adjustable padded seat and cushion pad handlebars. 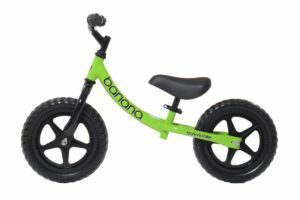 The bike weighs just 3kg, so this should be comfortable for a small child to handle and it is also extremely well balanced. 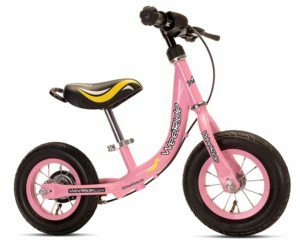 The saddle height starts at just 30cm and can be adjusted up to 40cm, so this places the bike firmly in the ideal size for 2-3 year olds. This bike features EVA foam tyres, so this means they are puncture proof and easy to maintain. One point to note is that the ride is generally smoother on air tyres than foam tyres. 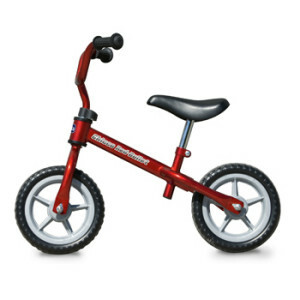 It is available in several different colours, and this is a great value BMX balance bike that is available for around £35. Our final choice is the Scooch BMX balance bike. 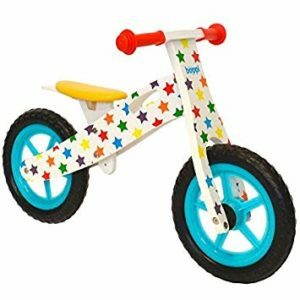 This bike has a clean and simple BMX design, with a steel fork and frame and spoked tyres which enhance the appearance of the bike. This bike has a slightly higher minimum saddle height than our other recommended bikes, starting at 35cm and going up to 43cm. This means it would be suitable for children aged 3 – 5 years. 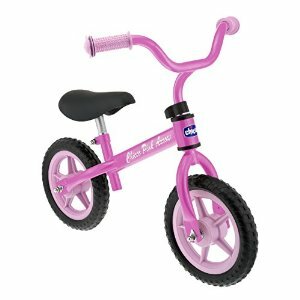 The comfortable grip handlebars make for an easy ride, and it is available in 3 different colours including blue, pink and red. 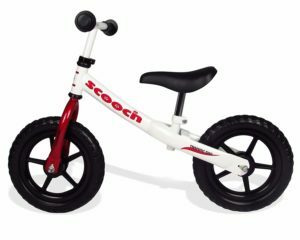 The Scooch BMX balance bike is on​​​​​e of the best value bikes on the market, with prices starting at just £29.99 so this is an ideal bike for those on a budget. Whichever bike you choose, don’t forget you will need accessories such as a good quality helmet and perhaps some gloves for extra grip. A Kiddimoto helmet is the perfect accessory to any of the exciting and innovative balance bikes in the Kiddimoto range. 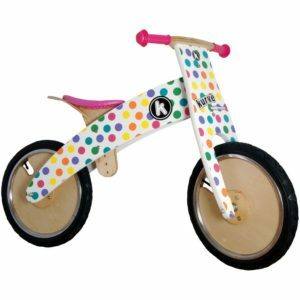 These include the funky Kiddimoto Kurves, the Kiddimoto Super Junior and a range of scooters and super bikes. 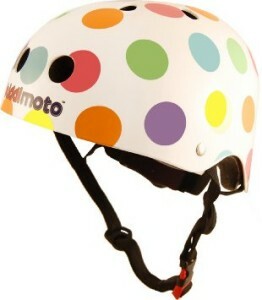 A Kiddimoto helmet not only looks good, but it also combines the essential elements of safety and comfort. 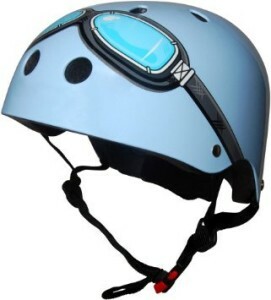 Features include vents in the helmet to keep the child’s head cool (small children’s heads can get very hot! ), extra pads for a comfortable fit and a hard plastic shell for protection. Some of the helmets also offer the option of being personalised with your child’s name – so this will be an extra incentive for them to be worn! We have pictured just some of the most popular Kiddimoto helmets below, and with such a great range of colours and unique styles there should be a helmet for everybody. 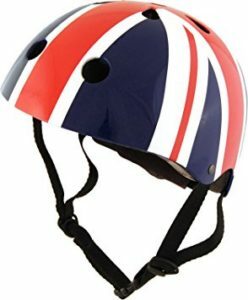 Some of the most popular models complement the bikes available in the range, so these include a Pastel Dotty helmet, the Union Jack helmet and the Official Evil Knievel Helmet. We also really like the Blue Goggle helmet, the Neon helmet and the Skullz design which look fantastic and will add an extra dimension to your child’s experience. A Kiddimoto helmet is not just for balance bikes, as they are multi-functional so can be used for other activities such as skating, scooters and riding other sorts of bikes such as BMX’s. They also conform to all of the required safety standards. An adjustable strap is included, although you will need to determine the size that you will require as most models are available in sizes Small, Medium and Large – and to do this you will need you should measure around the head just above the eyebrows. You will need a Small helmet if the measurement is 48 – 53cm, a Medium helmet for 53 – 58cm and a Large helmet for 58 – 62cm. Kiddimoto helmets are generally available from around £24.99, and this is a small price to pay for a cool and funky helmet that will also keep your child safe! 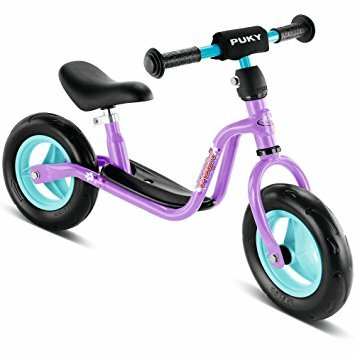 A fantastic option that will look great with any balance bike!